The family has requested memorials in lieu of flowers; however, if you wish to send flowers and do not have a local florist, we recommend the above florist. Please scroll down for service details, link to directions to the service, and memorial donation information. Born to Eternal Life Aug. 17, 2017. Beloved wife of James. Mother of James F. Bach Jr., Lisa (David) Worth, and John (Diane) Bach. Grandmother of Linden and Andrew Worth and Evan and Julia Bach. Sister of Georgianna (John) Yung and the late Raymond Ruppert. Further survived by nieces, nephews, other relatives and friends. 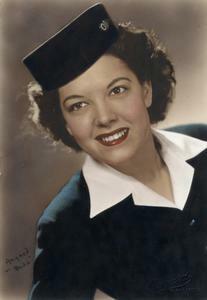 Marie worked as a flight attendant for Northwest Airlines, logging over 6 million miles. She eventually became their Washington D.C. lobbyist – even meeting President Harry S. Truman - before retiring to become a wife and mother. Her uniform is on display at the EAA Museum in Oshkosh. Marie loved to travel and was willing to go anywhere. She and Jim travelled all over the world – especially enjoying the winters they spent in Mexico and the Caribbean. Family and friends will gather in Lindsay Hall at EastCastle Place, 2505 E. Bradford Avenue on Friday, August 25, 2017 from 1:00 PM until the time of the Memorial Mass at 2:00 PM. Private inurnment St. Augustine Catholic Church Cemetery, Trenton, WI. In lieu of flowers, memorials to The College Endowment Association, c/o Jane Condon PO Box 1533, Brookfield, WI 53008-1533.